In a grim future in which mutants and their human sympathizers are systematically hunted and killed by towering, unstoppable robots called Sentinels, Wolverine travels back in time to prevent mass genocide in X-Men: Days of Future Past. This deftly scripted and unusually affecting installment of the long-running series is marked by the notable return of director Bryan Singer (X-Men, X2: X-Men United), who succeeds in delivering a film that ranks among the very best of the franchise. The film opens in a dark and desolate future that was set in motion in 1973, when brilliant scientist Dr. Bolivar Trask (Peter Dinklage) created a series of giant robots called Sentinels for the sole purpose of wiping out mutants, whom he claimed were a direct threat to the human race. Though initially programmed solely to target mutants, the Sentinels soon began eradicating humans who possessed the DNA to breed mutants, and eventually, any mortal mutant sympathizers. Desperate, Prof. Xavier (Patrick Stewart) and Magneto (Ian McKellen) devise a plan to have Kitty Pryde (Ellen Page) send Wolverine (Hugh Jackman) back to the year when Mystique (Jennifer Lawrence) assassinated Trask—it turns out that Mystique inadvertently accelerated the Sentinel program when she was subsequently captured by Sgt. William Stryker (Josh Helman), who succeeded at harvesting her DNA to make the robots more powerful than ever before. Upon arriving in the past, Wolverine quickly seeks out a much younger Charles Xavier (James McAvoy), as well as Beast (Nicholas Hoult) and Quicksilver (Evan Peters), and together they help break a young Magneto (Michael Fassbender) out of a heavily fortified prison cell hundreds of feet beneath the Pentagon. Meanwhile, with the help of Havok, Ink, Toad, and Spike, Mystique is already moving in for the kill. Although Wolverine, Beast, Charles, and Magneto manage to thwart the assassination, Charles and Magneto once again find themselves at odds after the latter attempts to alter the plan at the last moment, creating a mass panic during a post-Vietnam War peace summit in Paris. And Dr. Trask, still fuming from having had the Sentinel program rejected by Congress, takes his proposal directly to President Nixon (Mark Camacho), laying the groundwork for an even darker future than the one Wolverine was sent back to prevent. Between the time-traveling, the globe-trotting, and the plethora of characters both human and mutant featured in X-Men: Days of Future Past, it’s something of a small miracle that the film doesn’t dwarf The Wolf of Wall Street in terms of running time. Despite the challenge of telling a story that’s genuinely epic in scope, screenwriter Simon Kinberg manages to incorporate all of these daunting factors into a script that’s impressively lean yet rich in detail. Practically all of the key players are given satisfying story arcs that are true to their characters’ personalities and motivations, allowing us to connect with them on an emotional level. Of course, it helps that a talented cast has been tasked with bringing these characters to life, and thanks to some of the most talented actors and actresses of their generation, each of their arcs possess the appropriate gravity. 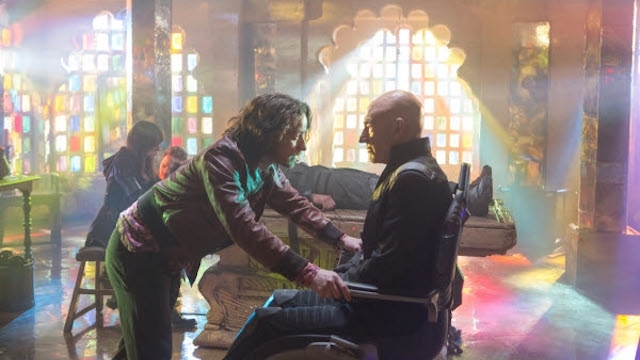 Fassbender and Lawrence in particular are incredibly engaging as the rogue mutants whose blinding rage prevents them from seeing the consequences of their actions, and Dinklage is deeply compelling as the man who fails to grasp the terrifying implications of his unrelenting xenophobia. It’s his character who serves as the lens for Kinberg to explore the psychology of fear that has fueled horrific atrocities such as the Holocaust, and that is never quite as far from reality as some would like to believe. Much like Wolverine’s mission, it all could have fallen apart so easily without a sense of focus, but Singer, returning to the franchise for the first time since 2003’s X2, crafts a sequel that stands shoulder-to-shoulder with the best of the series. Opening with a spectacular sequence that dares us not to blink as it introduces a nightmarish new threat, he is at the top of his game in terms of action, using spatial relations and special effects in ways that make the threat to the mutants unequivocally terrifying. Still, as any perceptive director would, Singer wisely softens the tone following the intensity of the incredibly grim introduction, emphasizing character development and humor as Wolverine arrives back in the early 1970s—especially in a showstopping scene in which Quicksilver helps to break Magneto out of the Pentagon. By disarming us with these sequences, Singer and Kinberg allow us to focus on the characters and their relationships—both crucial components when it comes to reinforcing the film’s central themes of actions and consequence. At a time when comic-book fatigue is as much a threat to the box office as the Sentinels are to the mutants, Singer’s ambitious sequel not only reinforces the strengths of the series that helped to kick off the millennial superhero-movie trend, but also maintains that, at their best, these films can be more than just mindless entertainment.